The 10th Working-Level Conference for Asian-Pacific City Summit was held in Bangkok, Kingdom of Thailand from December 17 to 18, 2014. The report is now available for you to download! 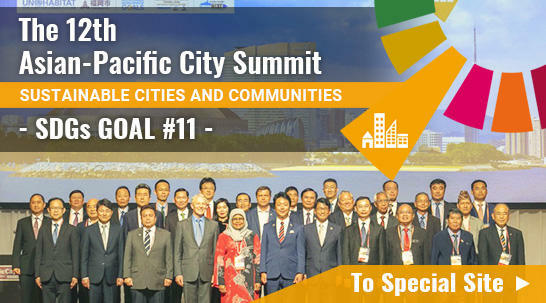 You can download the presentation data of the 10th Working-Level Conference for Asian-Pacific City Summit, which was held in Bangkok, Thailand from December 17 to December 18, 2014. Keynote Address "Accessibility and Equity to the Public Resources"
Bangkok 1: "Bangkok Aging Society"
Bangkok 2: "Accessibility and Equity to the Public Resources"
Dalian: "Responding to Population Aging by Enhancing the Sense of Happiness of Senior Citizens"
Fukuoka: "Fukuoka City's Measures to Address its Aging Society"
Kitakyushu: "The City of Kitakyushu's Aging Society Policies"
Kagoshima: "Kagoshima City's Efforts to Support Elderly People in Leading a Meaningful Life"
Kuala Lumpur: "Aging Society in Malaysia"
Busan: "Busan's Welfare Policy for the Elderly"
Gwangyang: "The Elderly Welfare Policy of Gwangyang City"
You can download Asian-Pacific City Summit 9th Working-level Conference in KAGOSHIMA report. The Conference was held in Kagoshima City, Japan from August 18 to 20, 2011. You can download the report of the 8th Working-level Conference for Asian-Pacific City Summit in Fukuoka, which was held in Fukuoka City, Japan from September 17 to September 18, 2009.